It’s time to look at Marvel’s latest installment in their expansive MCU franchise. Thanks to an early screening my brother got tickets to I was able to see this film a few days before it came out. It’s definitely a solid film that delivers on all fronts. It has all the classic MCU trends for success; strong dialogue, solid action, and quick pacing. The film doesn’t slow down the tempo and by the end you’ll be satisfied. The film starts off with an early mission with Carol and the other Kree operatives. It’s a classic extraction mission as they need to get one of their agents out of a hostile environment. The situation does not go as expected and deteriorates quickly. Carol now finds herself on Earth and must confront memories that have haunted her recently. Are the Kree keeping secrets from her? Whether she likes the answers or not, Carol knows that she has to seek them out. There’s naturally a lot more to the plot than that, but that’s a pretty general description so you won’t have anything spoiled. This is an early review so I’ll be even more careful than usual to avoid spoilers. Now, there is a general feeling among many reviewers that it’s bad to be predictable. A feeling where if you know exactly what’s going to happen in a film then it did something wrong. I don’t agree with that. Captain Marvel isn’t particularly subtle. All of the twists and turns are very predictable and you’ll always know what’s going to happen next. You’ll know which characters are the villains and which ones are the heroes. As Carol tries to figure out her past you’ll end up figuring it out first. To call it the most predictable superhero film may be pushing it, but there aren’t any surprises here, at least when it comes to twists. That’s likely due to a mix of the MCU formula telling you what to expect and general context clues. I’d argue that this isn’t a bad thing though. What’s important is the execution. As long as the film does a good job of getting to its goal then knowing where it’s going isn’t a bad thing and that’s what the film does well. It’s always a fun adventure. This is thanks in no small part to Carol herself. She holds the film quite well as a lead. I buy into her tough persona a lot more than previous heroines like Black Widow and Gamora. I’ve always liked characters who are fairly aggressive and Carol here is like Hal Jordan or Wonder Woman. Nobody’s going to push her around and anyone who tries eats a photon blast. Captain Marvel is consistently defiant throughout and that’s always a good thing. She’s a lot smarter than other leads as well in a practical sense as she doesn’t fall for an obvious trap near the end of the film that I think many others would have. I look forward to seeing her in End Game. The only concern naturally is how powerful Captain Marvel is. She’s closer to fighters like Superman and Supergirl than someone like the Hulk. It’s easy to see her quickly taking down someone like Thanos here. I think the writers are going to have to be extremely cautious with how her character is portrayed going forward. It’d be pretty annoying to see her nerfed or losing a fight for no real reason. Another plus for the film is the writing. MCU films are always a action/comedy blend which aim for a 50-50 split. The top notch films like Infinity War, Avengers, Winter Soldier, etc have a good blend. It’s the case for most of them to be honest as the franchise has been consistently great. The only exceptions have been films like Ant Man and Guardians of the Galaxy 2 which were on the weaker side. This one is a great example of how to do it right. There’s a lot of solid banter throughout and quality jokes. The humor scenes are funny though and aren’t forced. They also don’t take away from the fights. The heroes aren’t joking during battles, they take the stakes seriously and only joke before/afterwards. This also contributes to the film’s quick pacing. It has quite a bit of replay value here since no act drags on. The film’s always moving and that’s always important. A film shouldn’t just be good the first time around, you should be able to re-watch a movie and still enjoy it. That won’t be a problem with this one. The action scenes are solid and the film’s rapid humor style ensures there isn’t a large build up before the jokes that would be harder to sit through if you already know the punchline. I’d say that the effects look solid as well. They certainly aren’t for everyone as the higher-tier the fighters get the more obvious the effects become. It’s why people didn’t like Man of Steel’s effects despite being incredible. The colors are flashy here and the suits look good. Captain Marvel’s costume is incredibly accurate to the comics and stands out. The action scenes great and seeing Marvel fly through space blasting away at enemies is really cool. Naturally there is an after credits scene here so be sure to stick around. It’s definitely one of the better ones. I always particularly enjoy when these scenes further the plot along. It’s one of the more direct continuations though so I’m wondering if they’re going to have to show this in the actual End Game film as well or not. I’d appreciate the boldness of not doing such a thing of course as at this point you should be able to stick around for an extra minute or two to see what scene is at the end. I can understand skipping the more comedic ones of course, but since you don’t know which scene it’ll be you just have to test your luck. Of course the supporting cast here is solid as well. Nick Fury’s always been a fun character and it’s nice to have a younger version of him running around. He gets a pretty big focus here and is certainly right in the middle of many of the events here. He’s always quick on his feet and supports Carol pretty well despite having no powers. Coulson also shows up here although it’s more of a guest appearance than anything. He doesn’t do anything particularly big, but it’s always nice to see him around. There’s also Goose, the cat from the trailers. He’s naturally a lot of fun and I’m always up for having animal show up so long as nothing bad happens to them. Then we have the Kree operatives. Yon-Rogg makes for a very capable commander. He’s a solid combatant and always thinks strategically. I definitely thought he was a good character. There’s also the sniper Minn-Erva who is pretty ruthless. You can quickly understand her character which speaks to the writing. She doesn’t get many scenes but definitely ends up being one of the most compelling Kree members. The rest of them don’t make much of an impact. Meanwhile for the Skrull there is really only one major member. He’s decent, but not nearly as interesting as the Kree. I like how the Supreme Intelligence was shown here. It’s definitely a tough character to adapt and the way it was handled here makes a lot of sense. They also gave it a good amount of character even if you wonder how much of it is genuine. It’s definitely pretty cool. If Captain Marvel gets a sequel then I definitely see it getting more of a role. Of course, I would definitely have some serious questions about its appearance. You will have some questions by the end as this film takes place in the 90s as advertised. A lot has happened since then after all. The film has a lot of inspirational moments as expected. Between the standout visuals and the music there are definitely a lot of memorable moments here. While the 90’s music may not pop the same way that the first Guardians did, the tunes are good. I liked the song that plays during one of the final fights. It was really unexpected, but that partially plays into why it was so successful. There’s a lot of quality choreography during the fights as well. These villains don’t go down so they just keep re-entering the fight. Makes for an extended climax which is always good. 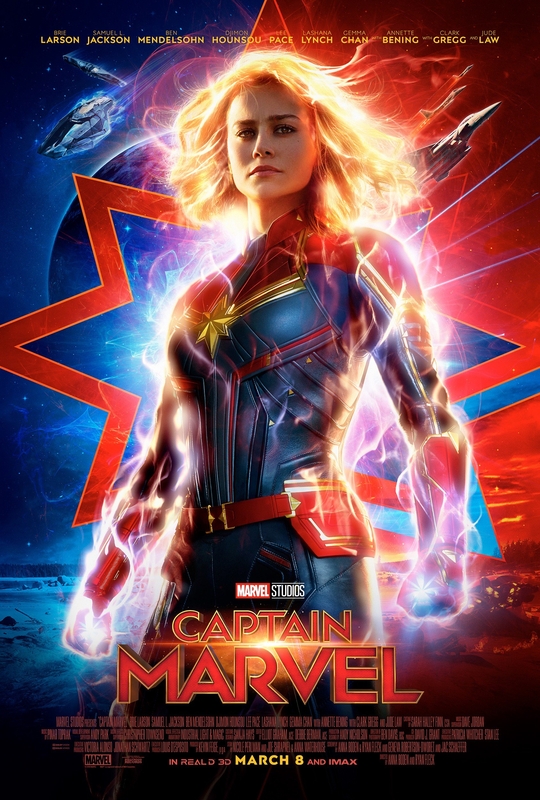 Overall, Captain Marvel is definitely a great film. I really had no complaints with it. It managed to succeed in all categories. Putting aside the crossover films it’s definitely one of the MCU’s best titles. If we don’t count sequels it’s certainly in the top 5 debut titles for a hero. I definitely recommend checking this film out in theaters. It’s also the kind of film that certainly benefits from a big screen so you can really take in the epic visuals. It’s always tough to continue making solid film after film so Marvel definitely deserves a lot of credit for that. Now the wait begins for End Game. The trailers have been pretty lackluster for that one, but it is nice that Marvel’s trying to keep the film pretty hidden. They did a good job of that for Infinity War as well as I managed to duck all of the TV spots. I’m definitely expecting a lot of fights for End Game.